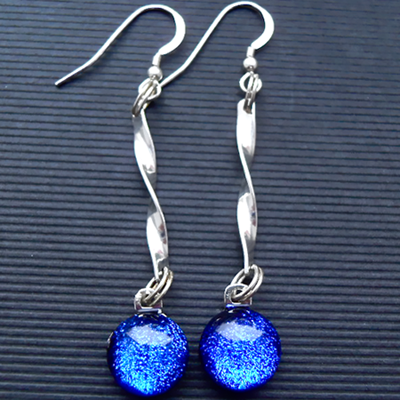 These long Blue/Purple Dichroic glass earrings have plated silver spiral design attachments. They are 6.5cm long including the Sterling Silver earwires. The glass pieces are 1.1cm x 1.1 cm and are made of two layers of glass. A layer of Blue/Purple Dichroic glass topped with a layer of clear glass. The long narrow very shiny plated silver design attachments are 2.8cm x 0.3cm. They come in a Silver or Black card giftbox, and have a matching bracelet.